Surrounded mostly by members of the newly formed committee, Ohio Gov. Mike DeWine signs an executive order creating the committee on childhood visitations to at-risk families. Standing to his left, dressed in blue, is Ohio’s First Lady Fran DeWine. Gov. Mike DeWine, First Lady Fran DeWine and leaders from the Ohio Children’s Hospital Association, (OCHA), on Tuesday announced the creation of an advisory committee aimed at ultimately helping to ensure at-risk families have the tools experts believe needed to give their children the best possible start in life. The Governor’s Advisory Committee on Home Visitation consists of roughly 15 childcare health and safety experts and advocates. Their number includes persons from government groups such as the Ohio Dept. of Developmental Disabilities, the chief of the Bureau of Maternal Child and Family Health of the Ohio Dept. of Health, numerous hospital officials, such as from University Hospitals Rainbow Babies and Children’s in Cleveland along with representatives from various community groups such as Moms2Be and REACH for Tomorrow. 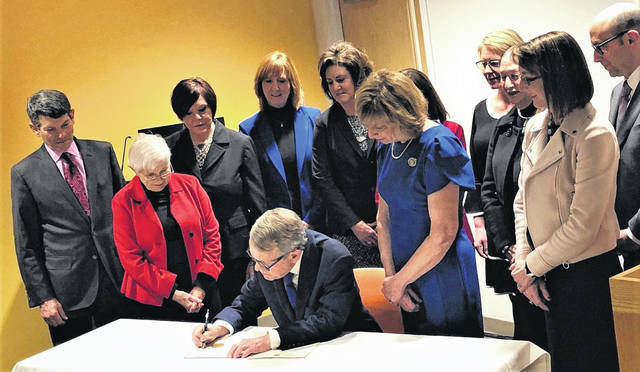 DeWine tasked the panel with making formal recommendations about how to best increase the state’s investment in effective home visitation programs. They will meet weekly over the next five to six weeks to inform the Executive State Budget, to be presented to the Ohio General Assembly in early 2019. DeWine’s Opportunity for Every Ohio Kid initiative includes a provision to give first-time mothers the tools believed needed to promote maternal health, child health and development, and school readiness by tripling the number of families served through home-visiting programs. “Evidence-based home visiting services are voluntary programs that serve at-risk mothers and children up to age three in their own homes. Ohio’s programs are grossly underfunded, reaching less than four percent of eligible families. These programs can help reduce infant mortality and improve school-readiness so that parents have the skills they need to help their children be healthy, happy, and ready for kindergarten,” DeWine said. https://www.portsmouth-dailytimes.com/wp-content/uploads/sites/28/2019/01/web1_Home-Visitation-02.jpgSurrounded mostly by members of the newly formed committee, Ohio Gov. Mike DeWine signs an executive order creating the committee on childhood visitations to at-risk families. Standing to his left, dressed in blue, is Ohio’s First Lady Fran DeWine.